Any process that requires bending and shaping of sheetmetal is inherently dangerous. Of course, modern production requires economy and efficiency; but can machinery ensure worker safety and simultaneously meet ever-increasing production needs? That question has been at the root of safety efforts in metalforming and fabricating machinery for decades. Advances in press-brake safety include the use of optical devices in combination with improved brake stopping times that enable operators to safely operate equipment without sacrificing productivity. Note how this device is placed to follow the ram and maintain a safe zone just below and in front of the tool. Photo courtesy of Trumpf Inc.
Press brakes offer no exception, and today, hard work spurred by that question undoubtedly has paid off. The evolution of press-brake safety continues, as press-brake manufacturers introduce new ways to address worker safety without sacrificing machine prowess. How has press-brake safety evolved? MetalForming took that question to the press-brake community. Why do Press Brakes Demand Such Safety Scrutiny? Powered presses, both stamping presses and press brakes, present a particular challenge due to the nature of the work, according to Tom Bailey, TruBend product manager for TRUMPF Inc., Farmington, CT.
1) The danger of the hydraulic or electric-powered press beam, where force is generated and the tooling comes together to form a part. 2) Danger of injury from the part being produced. The part must be handled during production and it will move during forming operations. 3) Danger from moving parts of the machine other than the press beam, most notably the backgauge system. These categories give rise to two approaches to reducing the potential for accidents around a press brake: equipment improvements and process improvements. Equipment improvements rely on press-brake manufacturers to develop safer machines, and we’ll focus on this course of action. A history of press-brake safety provides a glimpse of how manufacturers have addressed the issue, and how users have responded. Mechanical barriers, pullbacks and nonprogrammable light curtains represent early methods of press-brake operator protection, according to Scott Ottens, bending product manager for Amada America, Inc., Buena Park, CA. Pullback straps, or ‘leashes’ as they are sometimes called, secure to the operator’s wrists and adjust to prevent physical reach into the danger zone, but also didn’t offer the total solution. “These guarantee hand protection, but make operation cumbersome at best,” says Bailey. The subsequent advent of point-of-contact guarding, as it’s referred to in the ANSI B11.03 2012 Safety Requirements for Power Press Brakes, has improved safety while minimizing disruption of production. 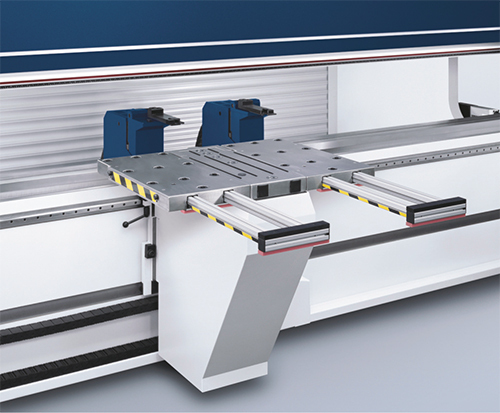 Bending aids, specially designed lifts that attach to the front of the press brake to lift and lower the part during forming, reduce working strain on operators. Photo courtesy of Trumpf Inc.
Point-of-contact guarding devices use a laser beam or array of beams, or a camera system to look at the area just in front of the punch as the ram travels up and down. These devices, working just ahead of the punch, guard a zone an inch or two ahead of the punch toward the operator, and then a distance below. “Operators can walk up with a small part and bend with their hands within less than an inch of the die and still be protected,” says Ottens. For example, notes Steve Lazinsky, president of Comeq, Inc., White Marsh, MD, laser-light security systems offer finger protection via a laser mounted on the top beam of a press brake, with a single laser beam located just below the top tool. “This cost-effective system offers a comfortable working condition, with no limitation in holding the sheetmetal during bending,” Lazinsky says. 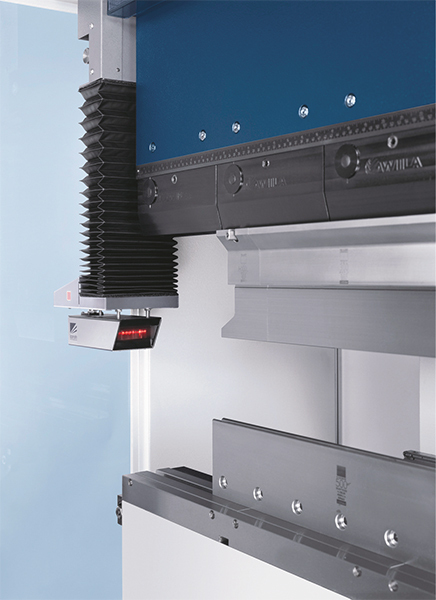 Point-of-contact guarding systems that include lasers and possibly cameras combine with foot-pedal and other switches and buttons via safety PLCs, which monitor all security-equipment connections. Dual-channel systems help ensure safety even if a single piece of multipronged safety equipment or a single signal fails. This state-of-the-art safety technology takes advantage of advances in brake-stopping capability and control electronics, such as the safety PLCs, that enable the ram to stop immediately when the zone is breached. In addition, advances in light curtains and refinement of methods and guidelines for their use also have improved safety while enabling efficient production of certain parts. In fact, light curtains may be the best option for a setup that creates a pinch point at a relatively long distance from the ram. Manufacturers also are mindful of dangers posed by CNC backgauge systems, and have taken steps to address injury potential from these moving parts. Another software-driven safety measure for CNC press brakes offers the ability to delay transition of the backgauges from one bending step to the next, or even to require operators to actively confirm that they want to change steps. This helps protect operators from sudden movement of the gauges. While manufacturers more and more include advanced safety mechanisms and controls on newly built press brakes, retrofits remain viable alternatives as long as the brakes have the stopping and other control capabilities to take advantage of them. Also pushing safety forward, organizations such as the Precision Metalforming Association manage committees that address press-brake safety issues and solutions, and ANSI standards undergo periodic review to update safety standards. Beyond these efforts, human safety can be improved by removing human operation. Obviously, unattended production impacts worker safety, an important attribute of automated press-brake and other panel-bending equipment. Panel benders provide efficient unattended production in applications where the product is shorter or thinner, or requires lower bends, according to Salvagnini officials. Another option is an automatic press-brake bending cell. A step in the automation direction are bending aids or sheet followers. See also: Amada North America, Inc, Comeq, Inc., Salvagnini America, Inc., TRUMPF Inc.